How then is it possible that Elizabeth Mountbatten, who is also known by the aliases “Windsor” and “QE 2″, is the richest woman on Earth, whilst hundreds of thousands of British people are homeless, with millions living in relative poverty and she has political parties of both left and right, in her illegal democracy? It is because the TRUTH about the British people’s true identity has been purposely hidden from them, by the monarchy, so that the people would not read The Covenant; relate it to themselves and demand that the monarchy gives back the wealth it has defrauded the people out of, by using its own illegal laws and taxes. 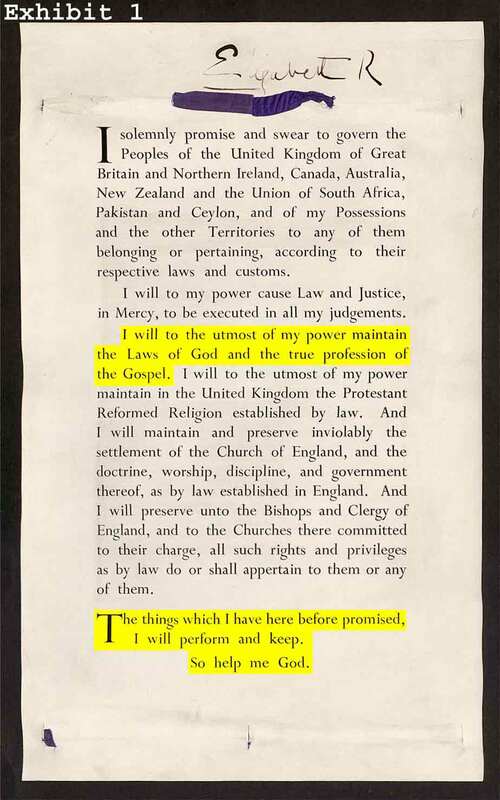 Elizabeth Mountbatten swore on and kissed the Sovereign’s Holy Bible that contains The Law and verses just quoted, at her fraudulent coronation, “to faithfully serve God and the people for the rest of her life”. Faithfully serving God means obeying Him and His Law, and, the first time she gave “Royal Assent” to any piece of legislation, she broke that solemn Coronation Oath and so was no longer the sovereign, with immediate effect, even if she had been crowned on the real Coronation Stone and had ever really been the sovereign, which she never was and is not. The British monarchy knows full well that it is descended from David and that the Stone of Destiny is Jacob’s Pillar and the Throne of David because they have ample evidence in their possession*. Why else then would they have hidden the TRUTH from the people, except in order to rip them off under their own laws. It cannot possibly be that they are ashamed of the fact that they are descended from David or that the British peoples are Israel, God’s Chosen people. The monarchy does not want the people to learn and keep The Covenant and God’s Laws, or they would teach The Covenant in school. They want people to obey their laws, under which they can keep the people in poverty and slaves to them and their friends. Employee is only a modern polite word for slave. The next sick joke is that the monarch claims to be “Defender of The Faith“, whilst doing the opposite of everything that Jesus said. If just Elizabeth Mountbatten’s wealth was redistributed back to the people, not counting all the others who have flourished under her and her predecessors’ laws, there would be something like £15,000 for every man; woman and child in Britain. An average family of four would be roughly £60,000 better off. If we include all the other parasites as well, that figure would be at least doubled. How many people having thousands of pounds would be out stealing, or living in cardboard boxes? 2:12 And they forsook the “I AM” God of their fathers, which brought them out of the land of Egypt (slavery under man-made laws), and followed other gods, of the gods of the people that [were] round about them, and bowed themselves unto them (including lords), and provoked the “I AM” to anger. There are at least 1200 members of the British “House of Lords”, including the heads of the churches, who help to govern over and keep the British people down and poor. Need I say more? Ezekiel 21:27 I will overturn, overturn, overturn, it (the Throne of David): and it shall be no [more], [overturned] UNTIL he come whose Right it is; and I will give it [him - Shiloh/Christ (Genesis 49 v 10)]. When Christ sits upon the Stone of Destiny, as prophesied through Ezekiel and is inaugurated as the King of all of the British people and of kings, the British Davidic monarchy will be finished; The Covenant reinstated and the wealth redistributed. Amen – JAH. * The fourth and final overturn began on Christ-mas Day in 1950 when God inspired and Christ assisted four Scottish Nationalists to remove the real Lia Fail / Stone of Destiny / Coronation Stone from Westminster Abbey for Him and replace it with the fake (Stone of Scone). George 6th must have known, as must his daughter Elizabeth, that the stone that was left at Arbroath Abbey on 11th April 1951 was a Scottish sandstone fake and that she was cursed by God and never really crowned. She must also have known the prophecy, as did her great, great grandmother Queen Victoria, who said that if Christ came to take the Throne, she would immediately step down and give it to its rightful owner, and everyone of them knew it down to George 6th. It is unthinkable that George 6th would not also have taught this to his children – that Christ would come one day and rightfully claim the British Throne, in fulfillment of prophecy. 1. Elizabeth Alexandra Mary Battenberg’s Fraudulent Coronation. The person who purports to be the queen has never, in fact, rightfully or Lawfully been crowned as the Sovereign. This knowledge stems from the fact that the Coronation Stone / The Stone of Destiny / Bethel / Jacob’s Pillar that Elizabeth Alexandra Mary Battenberg was crowned upon is a fake. The real Coronation Stone; made from Bethel porphyry, weighing more than 4cwt. (458lbs.) according to the BBC telex in the film “The Coronation Stone”, (Covenant Recordings), and Ian R. Hamilton Q.C. in three of his books: “No Stone Unturned” (pages 36, 44), “A Touch of Treason” (page 50) and “The Taking of The Stone of Destiny” (pages 27, 35); was removed from Westminster Abbey at 04:00 hrs on the 25th of December in 1950, by his group of four Scottish Nationalist students, which included and was led by Ian Robertson Hamilton himself. The other three were Alan Stuart, Gavin Vernon and Kay Matheson, as stated in his books. Further details at: http://jahtruth.net/stone.htm . A fake stone copy had previously been made in 1920 by stone-mason, Bertie Gray, for a prior plan to repatriate the Coronation Stone, and it was made of Scottish sandstone from a quarry near Scone in Perthshire, weighing 3cwt. (336lbs.). The conspirators had used it to practice with, before going to London to Westminster Abbey to remove the real Coronation Stone from the abbey. It was that fake stone copy which was placed on the High Altar Stone at Arbroath Abbey, at Midday on the 11th April of 1951, wrapped in a Scottish Saltyre (St. Andrew’s Flag – Dark blue with white diagonal cross on it) and found by the authorities, then transported to England, where it was used for the “queen’s” coronation, according to Bertie Gray’s children in a Daily Record Newspaper article. 2. Some of Elizabeth Alexandra Mary Battenberg’s other Crimes. 1. Mrs. Elizabeth Alexandra Mary Battenberg/Mountbatten; un-Lawfully residing in Buckingham Palace, London; also known by the criminal aliases Windsor and QE2, was knowingly and willfully, with malice-aforethought, fraudulently crowned on a fake Coronation Stone / Lia Fail / Stone of Destiny / Bethel / Jacob’s Pillar on June 2nd in 1953, and has been fraudulently masquerading as the rightful British Sovereign/Crown for the last 58 years, which the Defendant can prove beyond doubt, and is a major part of why the fraudulent British so-called “crown” is attacking the Defendant with this false, malicious, frivolous, ridiculous and politically motivated charge. It is Mrs. Elizabeth A. M. Battenberg who should be arrested and charged; for her innumerable acts of high-treason against God and Christ, Whose church she falsely claims to head and in defiance of Whom she had herself fraudulently crowned, and Whom she has continued to rule in defiance of, and in opposition to, ever since; not the Defendant. 2. Allowing people to legislate in defiance of God’s Law (Deuteronomy 4:2, 12:32) that she swore and affirmed, in writing, to maintain to the utmost of her power (Exhibit 1), and, in many cases, actually reversing what The Law states into being the very opposite of it. She has fraudulently imprisoned and punished people for enforcing The Law themselves as God commands them to do, and thus un-Lawfully prevented or deterred others from doing so. She has given Royal-Assent to 3,401 Acts of Parliament (as of 24/03/2011) and thus broken The Law against legislating 3,401 times. The very first time she gave “Royal-Assent” to ANY “Act of Parliament”, or any other piece of legislation, or allowed Parliament or anyone to legislate, she broke her Coronation Oath and was thus no longer the monarch, with immediate effect, even if she had been Lawfully crowned in the first-place, which she most definitely was not. 8. Ignoring the “Year of Release,” where all debts are forgiven/cancelled every seven years, and the “Year of Jubilee” every fifty years, where all property is redistributed back to its owner and the wealth shared out, so that there will be no poor amongst the people. 9. Elizabeth A. M. Battenberg has also broken God’s Law by allowing the EU, which is not the British people’s racial brother, but is a stranger, to rule over you / us, in contravention of Deuteronomy 17:15. 10. She has allowed Witchcraft and condoned it – http://www.dailymail.co.uk/news/article-1284449/100-UK-servicemen-class-pagans-MoD-reveals.html – and Satanism – http://news.bbc.co.uk/1/hi/uk/3948329.stm – in her/the realm and in her/the armed forces. 13. The person who purports to be queen was, in fact, as proven above, never rightfully nor Lawfully the Sovereign/Crown. Therefore the Crown/Prosecution/Regina has NO authority to put the defendant on trial and the judge has NO authority to try him, because the judge’s authority comes from her. 14. In addition, without prejudice to the above, based on God’s Law that she swore to maintain to the utmost of her power (Exhibit 1) the “queen” is in breach of contract. She has amongst other things accumulated a large amount of personal wealth and done many other things that are expressly forbidden, some of which are listed above, and so she has breached her contract with God and the British-Israel people. Therefore, even if, which is not admitted, the “queen” was genuinely crowned, the breach of contract disqualifies her from sitting and renders null and void proceedings instituted in her name. Hi, I fully understand what has been said above and agree with it 100 percent. I also understand that the police have two roles to play in society. Assuming that their role as a Police Constable under common law is governed by their oath of office in order to keep the peace. However, that oath of office as follows is directed at the Lawfully not valid Queen and therefore of itself is an act of treason. UK Police Officers oath which is referred to as the "Attestation"
All UK Police Officers swear this "Attestation"
"I, .. .. of .. .. do solemnly and sincerely declare and affirm that I will well and truly serve the Queen in the office of constable, with fairness, integrity, diligence and impartiality, upholding fundamental human rights and according equal respect to all people; and that I will, to the best of my power, cause the peace to be kept and preserved and prevent all offences against people and property; and that while I continue to hold the said office I will to the best of my skill and knowledge discharge all the duties thereof faithfully according to law." I am now assuming that the other role that a police person plase e.g. the role of Officer of the United Kingdom Corporation Ltd is just as invalid and treasonous. I am of the opinion that the police are essential for controlling the idiots among us who would do us harm. In that respect I am quite willing not to sit firmly on principles in relationship to the above. However, in extremily important instances, when the police are being obnoxious and the cards are down I would like to be able to impliment the following with confidence. Officer, can you tell me under what authority or power you have stopped / speaking to me? They go around the houses but must eventually arrive at the Queen. I say, We seem to have a problem here because in the case of Regina-v-John Anthony Hill 12 May 2011 at Southwark Crown Court in the case number T20107746 the Queen was declared to be A LAWFULLY NOT VALID MONARCH. That lawfully means that she has no authority to pass down the chain of command to you and therefore means you are acting unlawfully as well. HIGH TREASON IN THAT YOU HAVE SWORN AN OATH OF ALIEGANCE TO A LAWFULLY NOT VALID MONARCH. FRAUDULENT MISREPRESENTATION OF YOUR AUTHORITY AND POWER DERIVED FROM HER. LARCENY IN THAT YOU HAVE AND CONTINUE TO RECIEVE PUBLIC MONEY AS A DIRECT RESULT OF THAT FRAUDULENT MISREPRESENTATION. Naturally this cannot be an empty bluff and I would ultimately have to carry out the full arrest proceedure if the person concerned insisted on challenging my assertion. Coupled with this tool is the fact that I am Officially documented as being in a state of LAWFUL REBELLION and of course it is unlawful for the state or officer there off to harrass or harry me while I am officially in that state. The question I would like your opinion on, if I took the above to the absolute limits, and actually arrested the police officer under common law. At the moment, when I have used it, police officers who have been bullshy and arrogant have made a very quick exit saying that they were NOT telling me but only ADVISING ME OF THE SITUATION. What would chances of success be in open court if I persued such an action. I guess this is really just a confidence booster that I need to know that I am right in my assumptions and actions.